On Second Scoop: Ice Cream Reviews: DQ Blizzard in a Waffle Cone : Yay or Nay? DQ Blizzard in a Waffle Cone : Yay or Nay? So I forgot my wallet at home today and I didn't bring a lunch, so I thought I was in trouble until I remembered that I had a few bucks left on a DQ gift card in my glove box. Ok, I've got lunch now, but how to turn it in to a review since September (and October) both feature the pumpkin pie blizzard instead of something new. Wait, I have an idea! Now a small blizzard is usually sufficient to fill me up, but when I saw my server grab a mini-blizzard sized cup to gather the ingredients to put in my waffle cone, I got a little afraid. Yeah, a mini never fills me up, but maybe the cone will compensate. Speaking of cones, he asked if I wanted plain or chocolate. Well, chocolate ofcourse, because what could go wrong? Well, everything really. The chocolate could be fairly flavorless, the cone could feel not that fresh, parts of the cone could break apart and fall on the ground when I try to bite in to it, and then to top that all off the heart of the chocolate coated section was so tough I couldn't bite through it. At least the parts that fell bounced off my hand and not my shirt. The pumpkin pie blizzard section itself was fine, and the white plastic holder kept my hand clean, but really, why did I do this to myself? Well, I did it for you guys really (and to appease my own curiosity). I gave them a two dollar up-charge for a mini treat in an unworthy cone. Boooo. So, back to the title of this post, YAY or NAY my friends? 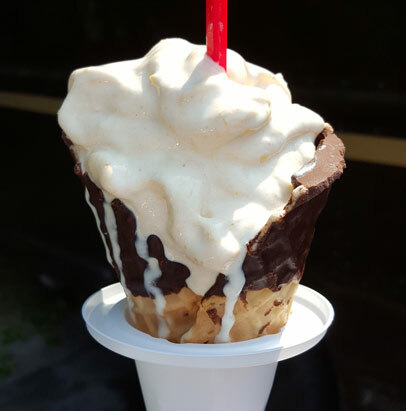 The blizzard in a waffle cone has been out for awhile now, so how many of you have tried it? And if you tried it, did you ever go back for another? Even with a better cone, I just don't see myself bothering with this small treat again. Buy Again? blizzards? yes. in a cone? NO. I have never had the Blizzard in a cone but I would vote no anyway. Seems to be too messy and stressful! I don't know if all Dairy Queens do it, but the ones near me have 99 cent sundaes on Thursdays...vanilla, chocolate, or twist with hot fudge and whipped cream. Nothing fancy, but a tasty and cheap treat.